Avatar: The Last Airbender, the absurdly popular animated fantasy epic that is not to be confused with James Cameron's Avatar or the wretched M. Night Shyamalan feature film. Book 1, aka season 1, of The Last Airbender follows Aang, a boy who was found frozen in ice by the siblings, Katara and Sokka, of the Water tribe. Aang is the Avatar, a "Chosen One" of sorts that must master the four elements of bending, Wind, Water, Earth, and Fire to bring balance to the world. For a better explanation of the series' setting, watch the short 30 second intro to the series. Being that the Avatar franchise, including The Legend of Korra, probably has the largest fanbase among animated series in America, I decided to give the series a watch, and it did not disappoint, for the most part anyway. My standards for animation is rather high considering my strong interest in Japanese animation, which almost always rivals anything the west produces, so I went into Avatar with heavy skepticism. Compared to the great dramatic heights anime can achieve, Avatar holds ups rather well. There are still parts that remind that Avatar was originally intended for a younger audience, but the series has plenty to offer for older viewers, who are willing to get past the slow start. Plot: 7.7/10- One of Avatar's strengths is how effectively the world is realized. The Fire Nation, the main opposing force of the series, is similar to many other evil empires in fiction and history: they want to conquer the known. A lot the visual and story elements are taken from Asian culture, particularly Chinese and some Japanese. There are some complex themes being thrown around in the series, and it works for the most part. Also, the series is mostly serialized with a clear end point in mind, which helps to prevent the series from wandering too much. On the negative side, there are still moments throughout the series that remind me that Avatar was originally intended for a younger audience. While the series turn towards a slightly more serious side in the second half of the series, the first half can be a little difficult to get through, especially the first few episodes. However, the finale had an almost Lord of the Rings level of epicness with real consequences, which is not found in American animation outside of a few series like The Clone Wars and Paul Dini's work in DC animation. Interesting, Star Wars: The Clone Wars creator, Dave Filoni, directed several episodes of Avatar, most of which were noticeably higher quality thanks to his skillful direction. In addition, the finale of the series shows true promise of the quality and seriousness that the series can display. Characterization: 8.0/10- The Last Airbender mostly follows the trio of protagonists, Aang, Katara, and Sokka, as well as the series main antagonists Zuko, Iroh, and Admiral Zhao. While not perfect (or nearly as strong as later seasons), Avatar's characters is one of its strongest aspects. Aang is the Avatar and the last of the Airbenders, hence the name of the series. He is an impatience kid, who is already proficient at Airbending. Throughout the series, he develops as a character, and must face his mistakes that lead the Fire Nation to becoming the overwhelmingly powerful force that it is at the present, although his naivety can become a little annoying in the early part of the series. Katara is the only Waterbender of her tribe in the South Pole. Her Waterbending skills are not particularly strong at first, but they grow as the series continues. At one point, her powers progress from being relatively skillful to mastery in a matter of a few episodes without a clear amount of time being given, which is odd. Sokka, one of my favorite characters, is the older brother of Katara and while he does not have the ability to Waterbend, he wants to be a valiant warrior like his father. Of the three main characters, Sokka demonstrates the most character development. Since he does not have any powers, it seems as though the series has more time to devote to his character, rather bending. Zuko, the outcast son of the Firelord, must capture the Avatar to redeem his honor and return from his exile. At first, Zuko seems like a typical cartoon villain that combats the hero every episode, but the series shows some interesting backstory and surprisingly complex character depth later in the season. Iroh, uncle of Zuko and brother of the Firelord, is a comedic relief character of sorts that helps Zuko on his quest. He is not evil, nor is he good, but morally ambiguous. He is often hilarious, and one of the best parts of the series. Admiral Zhao is another main antagonist that often clashes with both Zuko and the Avatar. He is not particularly fleshed out, but he is an imposing villain that serves his purpose. Of course, I could not forget the two animal sidekicks Appa and Momo. For the record, Appa is probably the coolest furry sidekick since Chewbacca! Action: 8.2/10- Almost every episode of the series ends in an action scene, and while some feel obligatory, most of the time the use of element bending is impressive to watch. Each style of bending is inspired by different forms of Chinese martial arts, which are fun to watch in action. Acting: 7.5/10- For the most part, the main cast is fine in their roles, but become better as the series progresses. On one hand, the side characters, particularly in the first half, feature some weak performances, although the second half maintains a higher quality of voice acting. A few notable voices actors like Jennifer Hale, who is famous for her roles as the female version of Commander Shepard in the Mass Effect franchise, as well as Bastila in the Knights of the Old Republic video game series. Art Style: 7.5/10- Avatar's animation is said to have been inspired by Shinichiro Watanabe's work on Cowboy Bebop and Samurai Champloo, as well as Gainax's FLCL (Fooly Cooly) and the works of Studio 4°C, Production I.G, and Studio Ghibli. Despite being an American animation studio, the eastern influences can be seen in the eyes and the smaller techniques such as occasionally exaggerated animations for comedic effect and a slight red coloring when a character blushes. Overall, the series' animation is still heavily western in style, for better or worse. In some ways, Avatar reminded me of a Japanese shounen series with its comedic tone and amount action, and while it is not as mature as a lot of anime, it holds up rather well in comparison. Unfortunately, the actual quality of the animation suffers compared to current animation since there has yet to be a HD/Blu-Ray remastering of it, so the edges of the animation are still a little rough at times. 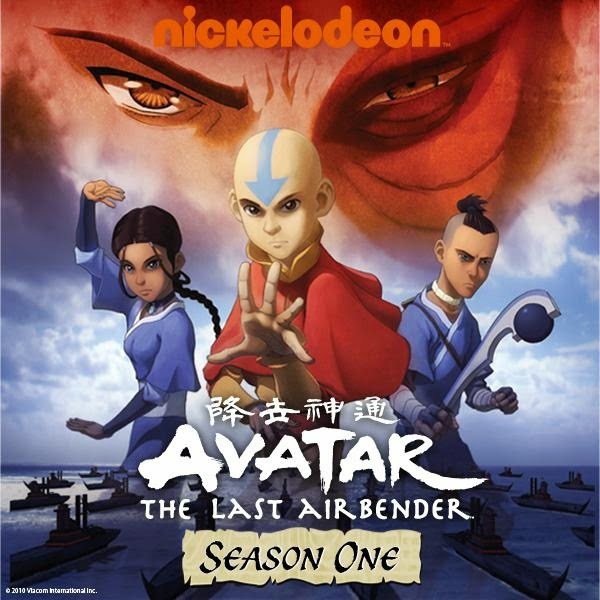 Soundtrack: 8.3/10- Jeremy Zuckerman's Asian inspired score perfectly suits Avatar's setting. There are some seriously strong tracks throughout. Humor: 8.4/10- Even though some of the humor is annoyingly childish at times, the series at be truly hilarious. Several scenes and remarks from Iroh and Sokka had me in stitches from laughing so much. Entertainment Value: 8.0/10- After forcing myself to slog through the first episodes, which are not necessarily bad, but not my style, I enjoyed my time with the series. It was not until the later part of the series where I became attached to the characters did I truly enjoy it. Overall: 7.7/10- Despite some early issues, Avatar: The Last Airbender is an entirely enjoyable experience for audiences of all ages, although the series' best is most definitely its finale few episodes. Also, for an anime fan such as myself, Avatar maintains a high enough level of quality for me to give it a watch, plus the series has a massive fanbase, including many of my friends. (Retrospective) Closing comments: Even though I wrote this review before continuing with the series, I want to say that Book 1 of Avatar is easily the weakest of the series with the later seasons and The Legend of Korra ranging from great to truly amazing. If you are interested in the franchise, definitely give Avatar a watch, even if the first season is a little slow. To read more of my animation reviews, you can click here.